One of my favorite activities of the summer is to go blueberry picking with the boys. We normally go with some friends and head out early in the morning so that we are finished before lunchtime. Sometimes we find more berries than other times, but we always have a wonderful time. I actually even get William to eat a few blueberries since he picked them himself. He has decided they taste much better if you pick them yourself. I normally am able to pick enough blueberries during the summer so that I can freeze them and have blueberries for baked goods throughout the year. 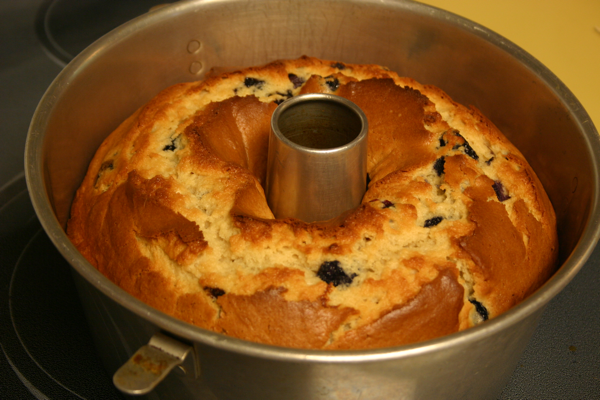 It seems to work really well and I avoid spending a fortune on blueberries when I have a craving for blueberry muffins, pancakes, or this yummy cake. I have noticed thought that recently blueberries have been very reasonably priced at the store so I picked up a pack during my last Costco run. 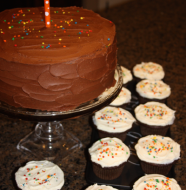 We had several people over for our small group and I knew this cake would make a great treat for us. 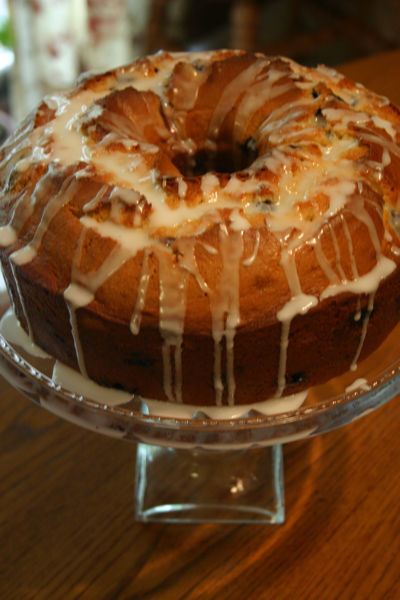 I love the sweetness of the cake that contrasts the bursting blueberries and tart lemon glaze. It is a wonderful taste of summer. I think you will enjoy this yummy pound cake whether you have it for dessert of for an indulgent breakfast treat to go with your coffee. I am honestly already looking forward to my breakfast tomorrow. Preheat oven to 350 degrees. Spray a 10-inch tube pan with cooking spray. Set aside. Combine sugar, butter, and cream cheese in the bowl of a stand mixer. Beat on medium speed until well-blended (about 5 minutes). Add eggs and egg white one at a time, beating well after each addition. Beat in vanilla. Lightly spoon flour into dry measuring cups, and level with a knife. Place the flour in a small bowl. 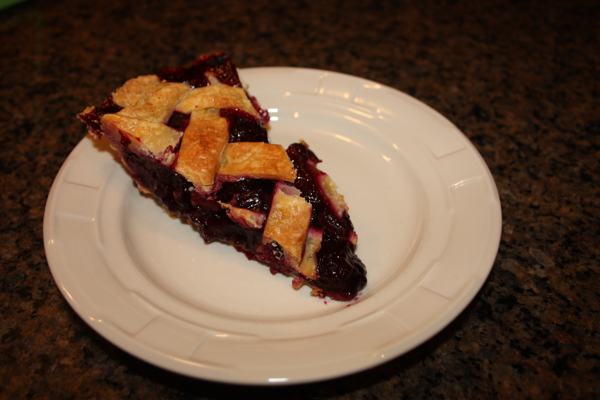 Remove two tablespoons of flour and toss in a small bowl with blueberries. Combine the baking powder, baking soda, and salt with the remaining flour. Add the flour mixture to the sugar mixture alternately with the yogurt, beginning and ending with the flour. Fold in the blueberries gently. Pour the batter into the prepared tube pan. Tap the pan on the counter once or twice to remove any air bubbles. Bake at 350 degrees for 1 hour and 15 minutes (or until a wooden toothpick inserted into the center comes out clean). Cool the cake in the pan on a wire rack for 10 minutes. Remove the cake from the pan and cool an additional 15 minutes. 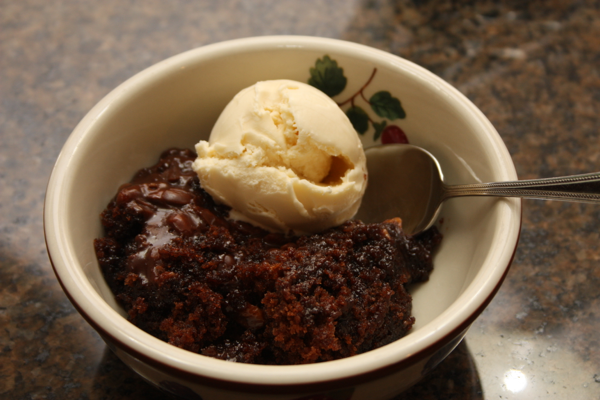 Combine the powdered sugar and lemon juice in a small bowl; drizzle over the slightly still warm cake. 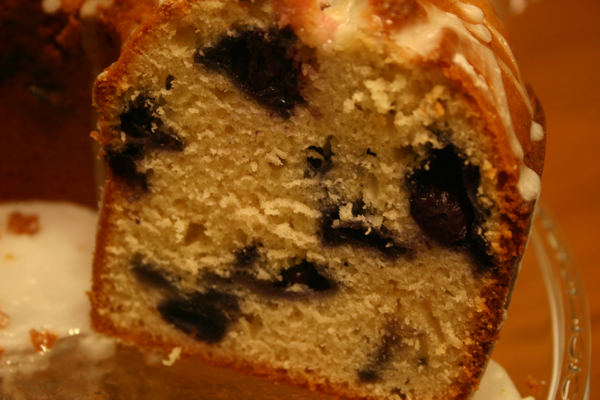 One Comment on "Blueberry Pound Cake"